Unbeaten Burlingame host Mankato-Rock Hills in the first round of the 8-Man, Division I playoffs. The Bearcats’ are making their first playoff appearance since 2004, while the Grizzlies last made the playoffs in 2012 when they finished as state runners-up to Ness City. Burlingame rolled to an unbeaten regular season that saw the Bearcats outscore their nine opponents by an average of 55 to 14. The Bearcats are led by senior Robert Hutchins, III who has rushed for 1,083 yards and 21 touchdowns on only 128 carries. Hutchins averages 8.5 yards per carry. Sophomore quarterback Dalton Sporing has played well in producing nearly 1,600 yards of total offense. Sporing has completed 60 percent of his pass attempts for 1,183 yards with 22 touchdowns on only one interception. He’s added 409 yards and 11 scores on the ground. Harrison Summers leads the Bearcats with 515 receiving yards and six touchdowns on 28 receptions, while Clay Thomas has caught 25 balls for 376 yards and six more scores. Senior Tanner Tyson has a team-high eight touchdown receptions. The defense is led by senior Paul Holt who has registered 105 tackles, including 14 tackles for loss and 13 sacks. Mankato-Rock Hills began the season with four straight wins before falling in districts to state-ranked Hanover, 50-16. The Grizzlies also fell 42-38 to Lincoln in district play meaning they needed to win at Clifton-Clyde last week to qualify for the playoffs. Rock Hills fell behind Clifton-Clyde 28-22 at halftime, but eventually pulled away for a 74-28 win. The Grizzlies are led by senior quarterback Spencer Callaway who has accounted for 1,827 yards of total offense and a combined 31 touchdowns. Freshman Zane Colson and sophomore Tycen Higer have contributed 433 and 417 rushing yards, respectively. Tucker Johanek is the Grizzlies’ leading receiver with 23 catches for 448 yards and eight scores. Wyatt Duskie leads Rock Hills defensively with 89 tackles. The Grizzlies give up an average of 24.7 points per game. Rock Hills has had three games decided by six points or less. The Grizzlies beat 8M-II qualifier Pike Valley (34-28) and Osborne (42-36) before the district loss to Lincoln. Both teams have made improvements from last season. 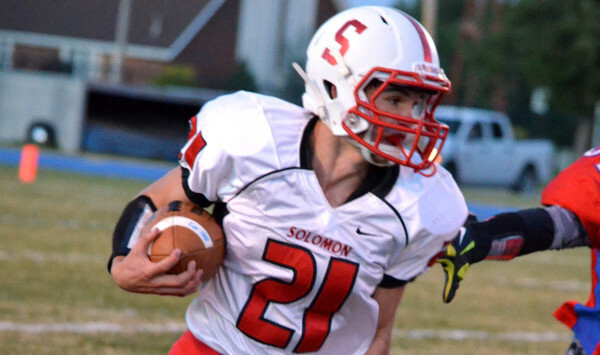 Solomon went 4-5 in 2014, South Central 6-4. The Timberwolves have been a consistent playoff team with eight trips since 2002, though are 2-7, including three straight first-round losses. South Central lost at Central Plains in the first round the last two years. Last fall, Central Plains went on to win the state title. This year, the T-Wolves only loss came in Week 2 to No. 1 Spearville (52-6) and they defeated several quality teams. South Central’s offensive production has remained relatively the same from 2014, though its defense has greatly improved. The defense allowed 23.6 points per game in 2014 and is down to 11.8 this year. South Central is 13-1 at home the last three years and has shown a great ability to force turnovers, with 32 last season and 34 this year. The T-Wolves are very experienced, especially with its great line led by seniors Alec Konrade, Michael Colter and Hayden Fletcher, while junior quarterback Gerald Morehead directs the offense..
South Central averages 350 yards a game, including 245 on the ground. Solomon is at 338 a game, including 189 rushing. Solomon has an average score of 48-12 under Steve Tiernan, in his first year with the Gorillas after successful runs at Osborne and Baileyville B&B. Last year, Solomon averaged 32 points a contest and allowed 46. Tiernan, 137-21 as a head coach, hasn’t lost in the first round since a 26-16 loss to Hope in 2007 when he was the coach at B&B. His son, Jake, has put together another great season with 88 of 125 passing for 1,337 yards with 22 scores versus three interceptions. Solomon is plus-9 in turnover margin with 10 turnovers. Solomon’s lone loss was 46-14 against Central Plains in Week 8. Two big keys will be turnovers and special teams – South Central also has four blocked punts – and how the long drive affects Solomon. The Gorillas have to go 191 miles one way to South Central. Eight-man home teams were 12-4 in the first round each of the last two seasons. Osborne, with the Tiernans, had the longest drive of the victorious road teams with a 171-mile trip to Peabody-Burns in a 66-44 victory last season. However, South Central is great at home, and led by the experienced line, makes enough plays to win.